I've never been a fan of savoury muffins. I've always liked the idea of them, and consequently tried a few different recipes, but have never been able to find an enjoyable one. They all seem to lack flavour, and filling, and be a bland dry little muffin that is a very dull thing to eat. So, I decided to make up my own. 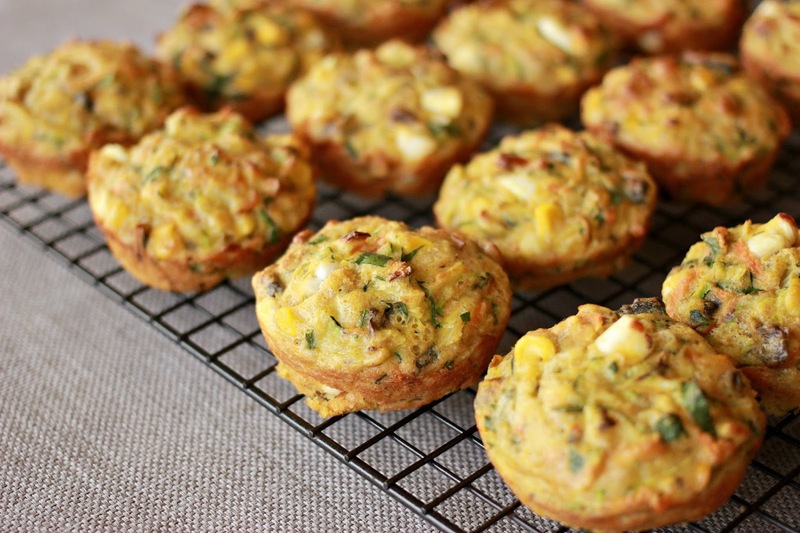 These muffins are really a relative of the quiche, being inspired by the Bottomless Quiche Recipe that my Mum has been making for as long as I can remember. 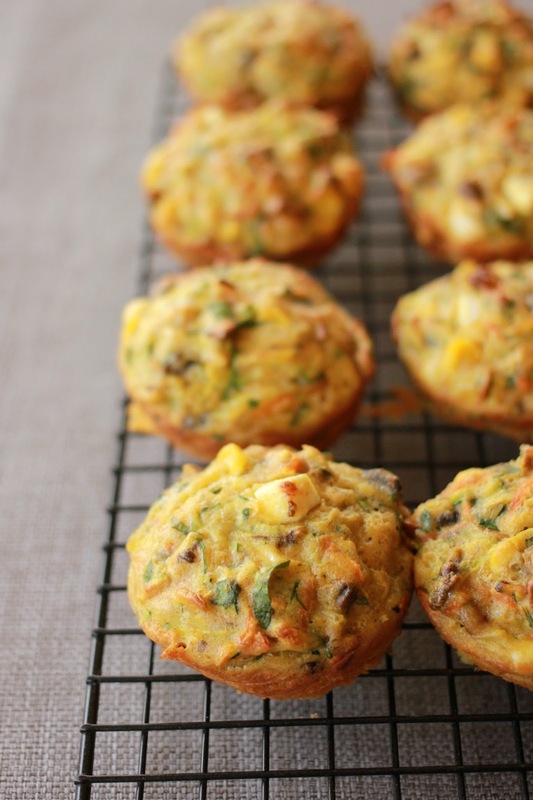 These muffins have a good dose of feta in them because I think it adds the loveliest flavour. They're also light on the flour and heavy on the veggies. You can change the ingredients to suit whatever you have on hand - just remember that they need a good amount of flavour, provided by cheese, herbs and plenty of veg. The first time I made them I added some finely chopped spinach and also added a little cherry tomato, sliced in half, to the top of each before baking. These are quick to whip up, very easy to devour and make excellent packed lunches. Do let me know if you try them and what you thought. 2. Put the flour and eggs into a bowl and whisk together. Set the batter to the side and as you dice, chop or grate each ingredient, add it to the bowl and fold it through. It's much easier to get everything evenly distributed if you fold it in one at a time. 3. When all the ingredients are incorporated, spoon the batter into the prepared muffin holes and bake for 25 minutes or until they have come away from the sides and are golden - they should feel springy under your finger in the centre. 4. Leave the muffins in the tin to cool for ten minutes before using a spatula or knife to carefully remove them from the tin. Allow them to cool for a few more minutes so that their bottoms "set" before serving. I love recipes and these are perfect for school tomorrow. I have all of the ingredients so will try and get them done this afternoon. I'll let you know if it do. You can :o) Our boys enjoyed eating them at school yesterday. Our daughter didn't want any; our fussiest eater. Our eldest son had 2 for afternoon snack. I love stir fried vegies too! This looks so good! Can we replace the zucchini with something else? Perfect for packed lunches Sarah...thanks for sharing.